Hands-on with the Naim NDS | What Hi-Fi? Sometimes good things turn bad, and sometimes adversity brings opportunities: both were involved in how I came to be using Naim's flagship streamer, the £6250 NDS, in my system at home. It started when we had an updating session in the office, with Naim's PR person coming in to ensure all the various review samples we have – including the NaimUniti2, to be reviewed in the November issue – were up to date with the latest firmware. After sitting in on this and chatting through various hi-fi stuff, I decided that evening to update the NDX I'm using at home. I had the firmware, and I must have done this a dozen or more times on various models without problems – I've even blogged about the procedure in the past – but while some say they find these upgrades fun, I still do every one with some sense of impending doom, and massive relief when it actually works. Pretty sure it was my fault – trying to do too many things at once, and mind two computers simultaneously, is never a great idea. Emails flew back and forth between me, the PR and Salisbury, and various 'turn if off, turn it back on again' routines were suggested, but the NDX wasn't having any of it, and so it was time to pack it up and ship it back to the factory for some TLC. OK, so ordinarily this kind of update would be handled by a retailer, so an owner would be unlikely ever to get into this situation, but help was at hand – Naim suggested that I borrowed the NDS and 555PS power supply we currently have for a forthcoming Temptations review, until the NDX could be sorted. However, having just got my new server set up and loaded with music, not having anything through which to play it proved too much of a torment after only one evening, so in a mood somewhere between trepidation and that of a kid let loose in a sweetshop, the NDS and 555 PS were trollied out of the stockroom, loaded in the car and away we went. The plan was to take the streamer home and set it up over the weekend – by now we were at Wednesday or thereabouts – which is probably why I found myself at 1am the next morning unboxing the NDS and slipping it onto the rack in place of the NDX. Actually, 'slipping' isn't really the right word: as I explained in my blog from the launch event for the NDS, the main boards within are on heavy brass platforms (above), 'floating' on leaf-springs, so transit screws have to be removed before you can use the player. And of course you can't stand the player on its side or upside down to do this, as the suspended boards, once free to float, would simply fall off the suspension – you have to remove the four screws, which have black plastic grips on them, from below. The only way to do this was to have one end of the player on the rack, and the other held out in space with one hand, while the other undid the screws from below. Almost, but not quite, as nerve-wracking as doing one of those firmware upgrades, not least because the NDS is heavy enough, at around 13.5kg, to be awkward to manoeuvre in these circumstances. Eventually it was done, and I hooked up the player to the XP5 XS power supply already on the rack – wasn't keen to start hefting power supplies around at that time of night. Just to explain, the NDS – like Naim's flagship CD555 – has no onboard power supply, but needs to be used with a offboard unit. It has two power supply inputs, and can be used with an XP5 XS (above) or XPS connected using an SXPS Burndy cable with a linking plug fitted into one of the inputs, or (as below) with the 555PS using an SXPS and 555A Burndy connectors between the two sets of power inputs and outputs. What I started with is the entry-level NDS configuration, bringing it to £7845, and this proved a good way to find out what the NDS alone was bringing to the party. It was going to be a quick listen, as the ailing NDX and XP5 XS were due to go back to the Naim factory very soon but, as it turned out, I spent the next morning leafing through the music on the NAS drive. I was enjoying the added clarity and power the NDS brought to the sound, and suddenly not missing the forlorn NDX, by now sitting on the floor, one little bit. 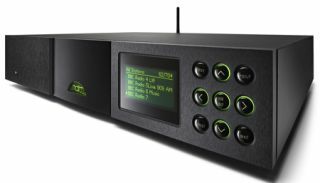 By the end of that morning, the lure of the second big Naim box proved too much, so out came the 555PS, the two fat power cables were uncoiled and straightened out behind the rack, everything was connected and the 555PS power switch turned on. Fortunately, both the NDS and the power supply had been run quite a bit before I snaffled them, so I was spared the lengthy run-in from which past experience tells me Naim products tend to benefit. By now we're up to £12,620 – for a network streaming player! – and comfortably the most expensive front-end I'ver ever used in my home system. And for all those who'll tell you that it's all just 1s and 0s, and the quality of the streaming hardware, DAC and audio sections can't make that much difference to the sound of music streamed over a network, I have only one word to say: 'listen'. I've been doing just that for a week or so now, and – IMO, of course – the sound being delivered by the NDS, through what is by no means Naim's top-flight amplification option, is more than a match for any CD player I've ever heard. And when playing high-resolution music it's more than capable of sounding entirely spectacular in a way I have never heard before at home. To these ears, the bass is massive, tight and well-delineated, with amazing textures in orchestral cellos and double basses, the midband is as open and expressive as you could ever want, and the amount of detail, clarity and sweetness is often breathtaking. As Mrs E, who's usually a sound judge of these things, said, 'You've changed the amplifier, haven't you? It all sounds so much bigger.' Close, but no cigar this time! Yes, I'd had the 'step up' demonstration down at Naim at the launch event, though admittedly through unfamiliar speakers – I haven't spent enough time with the Ovator S-600s to work out what the speakers are doing, and what's down to the amp – and with some listening fatigue setting in as the same track, not always to my taste, was played over and again. And yes, I could hear improvements as we stepped up through NDX, NDX with power supply and finally NDS. But hearing what the player could do at home has proved even more interesting, and even during the past weekend's mini-heatwave the windows of the listening room have been closed so the level could be cranked a bit more with everything from big-band orchestral Wagner (in 192kHz/24-bit) to some FLAC rips of some forthcoming CD releases I have been using for some other Gramophone testing. In every case, the sense of just getting more of everything, but it all being focused into just making the music more real, has been inescapable. To be perfectly honest, I really wanted not to like the NDS; wanted it to be just a marginal improvement over the NDX; wanted to be able to send it back with a 'thanks for the chance to have a listen – it was fascinating, but I'll go back to what I had now'.